Gas Insert Special is Back!! Liner kit included FREE w/ any gas insert purchase- a $481 value! Established in 2003, we bring over 40 years of experience designing and building fireplaces to every job. Employing full-time stone veneer masons and installers, there is nothing we can’t handle. The best products, the best workmanship, and the best customer service IS Badgerland Fireplace! Badgerland Fireplace Inc. is your #1 resource for fireplaces, fireplace accessories and fireplace services. The fireplace is often the focal point of the living room, den or patio. We understand the importance of having a fireplace with just the right look, as well as one which is properly installed and well-maintained. Whether you are using your fireplace to heat your home regularly or only occasionally when guests are over, it has to work safely, perform well and look great. Our goal is to ensure your complete satisfaction with your fireplace, whether it's one we install for you or one we repair for you. If you're looking to have your dream fireplace built, start with a visit to our Waukesha fireplace showroom for some inspiring fireplace design ideas. We have over 20 functioning fireplaces on display, with facings in tile, marble, stone and brick. Badgerland Fireplace Inc. carries a wide range of brands to ensure you get a fireplace you'll love. The primary fireplace brands we carry are Heatilator and Heat&Glo fireplaces and inserts. We also carry Majestic fireplaces and Wilkening Ultra Great heat exchanging fireplace inserts. Accessories include Design Specialties fireplace glass doors, Realfyre and Grand Canyon gas log sets, decorative termination caps, as well as a variety of fireplace tools sets, creosote cleaners and fireplace matches. 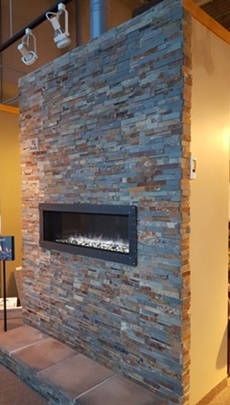 If you're considering a custom-built stone fireplace, we offer superior manufactured and natural stone veneer products from some of the top suppliers in the business, with full-time stone veneer masons to provide professional fireplace installation. 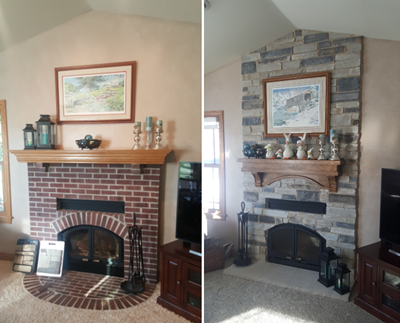 In addition to stone fireplace facings, we also install stone veneer on interior and exterior walls for both homeowners and home builders throughout southeast Wisconsin. We get many calls from Milwaukee area homeowners who are tired of their soot covered, outdated looking wood-burning fireplaces and want something more contemporary and more efficient. Our fireplace makeover pros are here to help. In most cases, the fireplaces we make over are wood-burning fireplaces originally built in the 1940s through 1960s, but sometimes they’re gas fireplaces from an era when the gas log set looked ridiculously phony. The technology available today in direct vent gas fireplaces is far superior to what was available even a decade ago, as are the aesthetics. Whether you’re looking for the rustic appeal of stone or a traditional wooden mantle with columns, our fireplace designers can transform your old eyesore of a fireplace into the centerpiece of your living room (or any other room). Need some inspiration? Stop by our Waukesha fireplace showroom and check out the fireplaces on display. Our prices for fireplace construction and fireplace makeovers are surprisingly affordable. Of course, the more elaborate the fireplace is, the greater the cost. But we've proven over and over again that it's possible to have a beautiful fireplace at a reasonable cost. Why not request a free quote to find out for yourself? 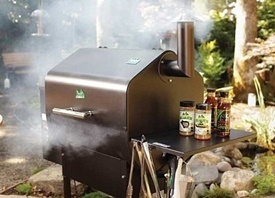 Badgerland Fireplace is pleased to be an authorized dealer for Green Mountain Grills. These innovative and well-built grills broke the price barrier for pellet grills when they debuted in 2008, and they’ve only gotten better since then. Not into standing by a grill all night? Their WiFi option, which lets you monitor and adjust the grill from your smartphone, takes a lot of the hassle out of cooking big cuts of meat. Instead of being shackled to the grill, you can make temperature adjustments from your living room via your smartphone. You’ll find rave reviews for Green Mountain Grills all over the Internet, and you can check them out in person at our Waukesha showroom. Badgerland Fireplace Inc. is dedicated to your complete satisfaction from your first visit to our showroom to the day your fireplace is completed. Our service doesn’t stop when your fireplace is finished, either. We also offer professional fireplace and pellet stove repair and maintenance services. Even if we didn't install your fireplace, we can maintain or repair it for you. We provide service and professional fireplace installation in Milwaukee, Waukesha and the surrounding areas. If you're not sure if you are in our service area, give us a call and ask. Some of our customers are definitely not in the immediate area, so you may be surprised. If you're considering having a fireplace built or a fireplace insert replaced, start by taking a look at some of the fireplaces in our Wisconsin fireplace design photo gallery. Then, stop into our local fireplace showroom in Waukesha, where we have over 20 fully functioning fireplaces on display. Winter always comes sooner than we expect and lasts longer than we want. Besides improving the ambiance of your home, a fireplace can help you save on energy costs while keeping your home comfortably warm. A professionally designed fireplace adds lasting value to your home, provides supplemental warmth and brings charm to any room. Visit our Waukesha showroom and learn which type will work best in your setting. For a ballpark price, you can also call us at 262-796-9999. 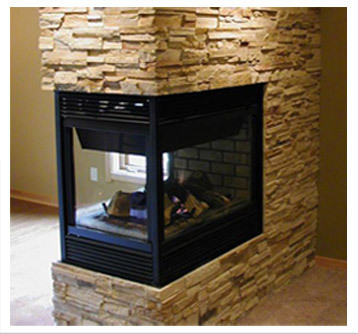 Contact our Milwaukee fireplace installation pros for a FREE estimate on a new fireplace.